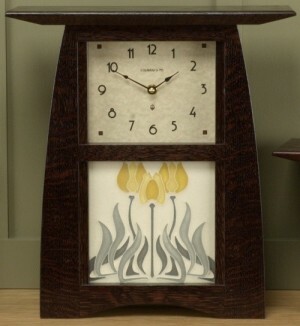 Handmade by our friends at Schlabaugh & Sons in Iowa, this Arts and Crafts style clock comes with your choice of any of our 6x6 Motawi tiles (pictured here with the Tulips tile #6644, in "Butter"). Crafted from quartersawn white oak and finished in a rich, deep stain that matches our own Signature Finish. Parchment face. 12.5" w x 13.5" h x 4.5" d. Please specify which 6x6 Motawi Tile you would like us to install in the "customer comments" section during check out.